I've sat through (more often, suffered through) several Indian productions, beginning in my college days, when I'd watch them from a projection booth window while friends were running films for the campus' India Society. Despite some colorful moments, I was rarely impressed. That said, this bizarre slice of Bombay superhero silliness changed my mind. Directed by Shekhar Kapur (critically acclaimed for 1994's BANDIT QUEEN), the story is awash in plot twists so heartwarming that you'll want to puke; but there are also so many lovably asinine moments that it's difficult not to enjoy (particularly with the aid of a Fast Forward button). 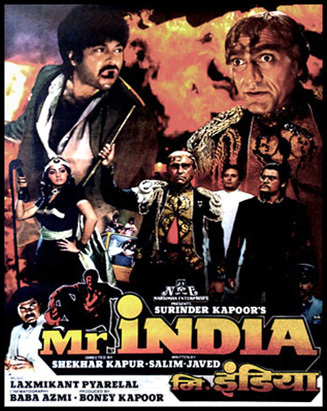 There's a crime wave in India, headed up by a super-villain named Mugambo (Amrish Puri), who's straight out of an old Republic serial (think Ming the Merciless on an Al Adamson budget). With his objective to "spread destruction" (now, that's specific), this guy has a palatial island compound, robot servants, a scientist named Dr. Fu Manchu, and an ever-present catch-phrase, "Mugambo is pleased." Plus, what's a hide-out without a secret vat of bubbling acid under the floor? Or sycophantic henchmen so loyal they'll happily leap into it when Mugambo commands? A blatant symbol of British colonialism, he figures that India is already so fragmented that if he just supplies people with enough guns, they'll wipe each other out. So far, so good. But that changes when we meet a big-hearted lug named Arun (Anil Kapoor) and his sickeningly-cute army of adopted kids. One look at these supposedly-adorable rugrats, and I realized I'd rather be trapped in a closet, on cheap heroin, with the cast of ANNIE. Then there's spunky, child-loathing female reporter Seema, who unknowingly rents out a room in Arun's makeshift orphanage. When their football smacks her in the head, she keeps it, thus prompting a song-and-dance number as these detestable children plead to get it back. Help. No surprise, I applauded Mugambo's plan to evict these rent-owing orphans and turn their home into an arms warehouse. He even cuts off the orphans' food supply (which is pretty easy, since Arun has been mooching off the neighborhood grocers for years). But just as things look darkest, Arun discovers an invisibility wristband, left to him by his scientist father. 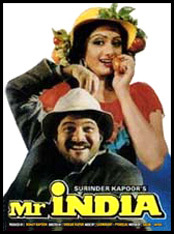 Enter Mr. India, "an ordinary Indian" who promises to destroy all exploiters of the Indian people; and while Seema can't stomach Arun, she's immediately smitten with our see-thru hero. Thick with cheap melodrama (including a dead orphan), Mugambo is the most entertaining character within camera range, as he poisons children's food and (in typical Blofeld-on-a-budget tradition) plans to blow up India with his missiles. Meanwhile, the best musical number has bare-midriffed Seema shimmying in a heavy rain, with fountains gushing, during a none-too-subtle love duet with Mr. India. Another jaw-dropping sequence features Indian actors in black-face! The no-tech special effects consist of Arun fading in and out, or a chair's cushion depressing on its own. Yet even with all of its over-the-top charms, at 2-1/2 hours (! ), this is definitely not for everyone.